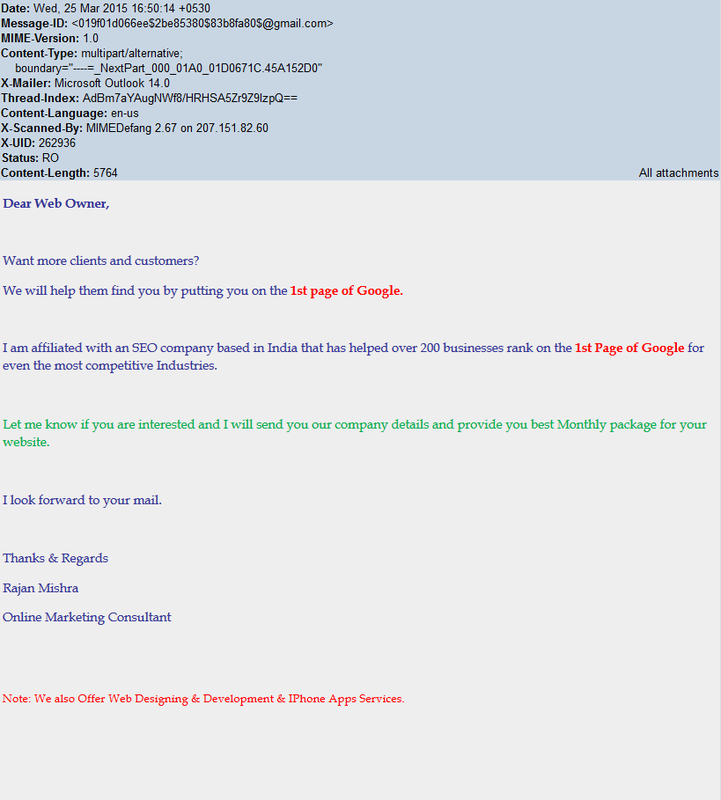 EVERY day – on every domain I manage we get SEO spammers from all over – they will all get our site on the first page! Well that is simply amazing because the first page does not actually have room for all of the sites we manage! SO that would be a lie and there is hardly a better reason for walking away from a potential business relationship than that! OH but wait – there is MORE. I am annoyed and this person is costing me TIME AND MONEY – right off the bat. Because I try very hard to keep spammers away from our mail servers. Don’t get me wrong – I love Google – I use Google – and I have a gmail account that I use for some services. But what I do NOT understand is how GOOGLE continues to allow this abuse of services. They hire the masters of algorithms – they could be tracking this kind of abuse of their mail systems. Subject: Ref:Quote for 1st Page on Google!! This is your first problem.